John Lamb | all galleries >> Galleries >> Otago Harbour. New Zealand > The most dangerous animals in the world. The most dangerous animals in the world. A normal family out for a Sunday afternoon stroll by the sea. This area is well known for the wildlife, sea birds and fishing. 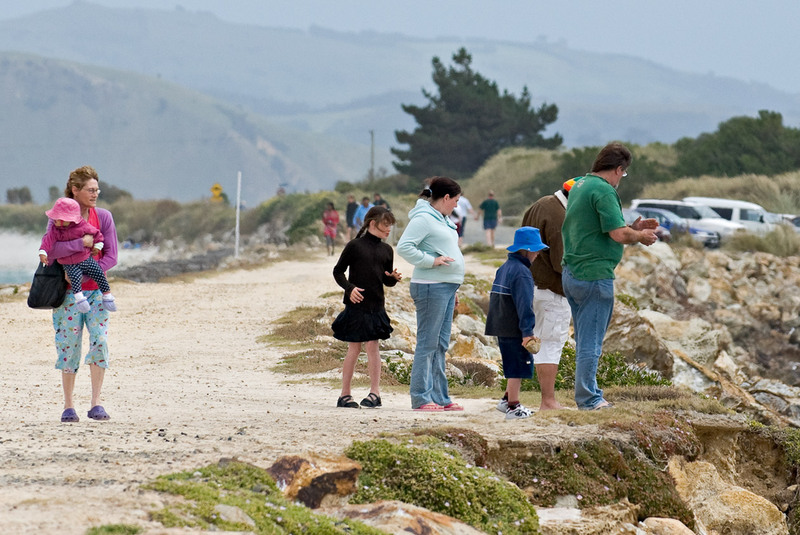 Many locals as well as tourists visit the area. Now look closly at the young boys hand. Yes, he is holding a rock, that he is about to drop onto a basking Fur Seal. His "father" wipng his hands has just done the same. As I approached the "mother" told me there was a seal on the rocks. "Yes" I said. "I thought they weren't just dropping rocks into the sea." Human behaviour disgusts me sometimes. All images © John Lamb. All rights reserved. Do not download or use images without prior written approval. Unfortunately those kids are learning from their idiot father and will pass it on to their own kids someday. Not an isolated case either! I really want to believe they were harassing the seals and not hitting them. Not that that's ok either. But if you saw them actually hit the seals with the rocks, could you have called the police? "Human behaviour disgusts me sometimes" - I second that...for the same reasons.